The Samsung Galaxy Core we have here on campus is of the dual-SIM variety which, in theory, should do worse than the single-SIM edition, having to power a second radio all the time. But is it really that bad? Find out after the break. Now, the Samsung Galaxy Core comes equipped with an 1800 mAh Li-Ion battery, which needs to deal with those dual radios but also the Snapdragon S4 Play chipset and the 4.3″ WVGA screen. Those last two bits have proven to be pretty efficient, so the Galaxy Core is not without its chances to impress here. The Samsung Galaxy Core managed almost 12 hours in the talk time test – 11:52 hours to be exact, which fairly good, considering that the low-power chipset and the screen can’t help it at all here. Web browsing is where the SoC and the screen do play a big part. The Samsung Galaxy Core lasted 6:54h, which was enough to place it in the upper half of our table and comfortably above the other dual-SIM smartphone we recently tested, the HTC Desire 600. And finally we come to the video playback test. The Galaxy Core didn’t get to shine here, with its score of 7 and a half hours sending it lower down the ranks compared to the other two tests. 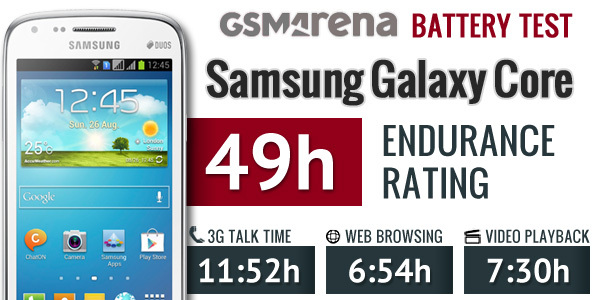 When all is said and done and we combine the three results with the stand-by time of the Samsung Galaxy Core we arrive at a rather good endurance rating of 49 hours. That’s going to be the interval between your charges if you do an hour of calling, web browsing and watching videos each a day. That’s a very impressive result and points that the single-SIM Galaxy Core will get an even higher one because it doesn’t need to deal with a second always-on radio. 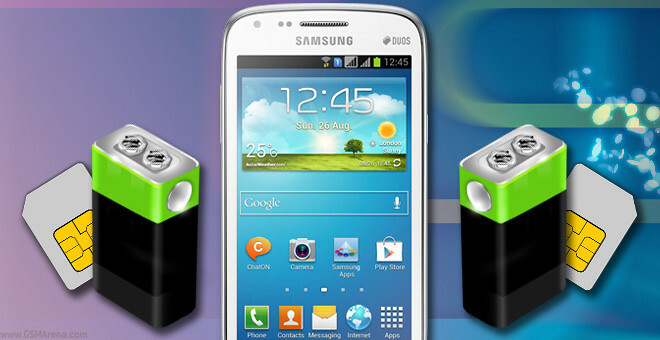 But even the dual-SIM Galaxy Core gets more than enough juice out of the 1800 mAh juice pack.